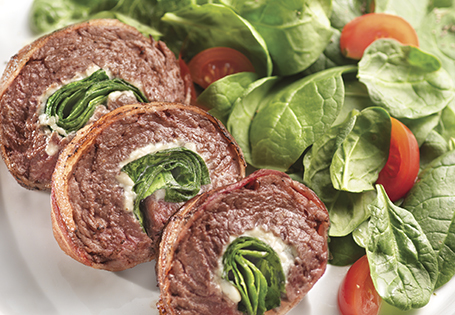 Cube steak stuffed with spinach and blue cheese, wrapped in bacon. Season both sides of cube steak with salt and pepper. Sprinkle blue cheese on top of cube steak and top with spinach. Roll into a cylinder. Wrap with two pieces of bacon and secure with a toothpick if necessary. Place on grill and cook for 5 minutes per side, or until bacon is crispy and cheese is melted. Reduce heat on grill if necessary to prevent flare ups.